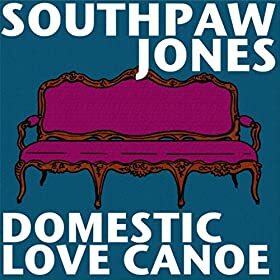 Announcing the first Southpaw Jones album since 2008. It’s not a CD! It’s not a record! But it’s as real as you and me. I am releasing Domestic Love Canoe to the online wonderland (Amazon, iTunes, etc.) on Tuesday, June 24. It’s a collection of 10 solo performances, each with a different approach to the subject of love. Take this journey with me from lustful infatuation through awkward struggle all the way to mature, adult partnership. While not 100% autobiographical, this album represents my personal climb and does a decent job of answering the question, “Where have you been and what have you been up to?” I hope you buy it, like it, and share it. Visit Amazon for an exciting preview and a chance to preorder. To celebrate, I have a couple of special performances in the days following this release. I’ll perform my very first online-only show on Wednesday, June 25, as part of Concert Window’s Austin Invasion. I’ll set up a comfortable performance setting in my secret creative space, slap on some house pants, and beam live songs straight through my laptop to your eyes and ears. Can you dig it? I don’t tour much anymore, so this is a rare opportunity to see how I’ve grown (aged) over the years. You can sign up for the show and pay what you want right here. The next night, Thursday, June 26, I’ll reunite with Matt the Electrician at the still-new-but-already-legendary Strange Brew in South Austin. If you haven’t seen us in the ten (10) years we’ve been playing together, don’t put it off another decade, because this room is perfect for us. Details here. What else has been going on since last we talked? • I released a lyric video for Second Kiss, the first radio hit single from Domestic Love Canoe. • I tried some good old-fashioned McConnelling with a song I wrote for 20×2 2014: What’s the Last Thing You Remember? • I threw my hat in the ring at the annual O. Henry Pun Off in downtown Austin. I did not win, but I had a blast, and if you’ve ever spent time in Austin, you might enjoy my references. See the whole two minutes on YouTube. For national coverage of the Pun Off, including a flash of yours truly, check out this video from CBS Sunday Morning. • I got a new-but-old electric organ from my friend Robert Steel who released a brilliant record called WOLF. Thank you, sir. And thank you, fair reader, for keeping up!